Notes highways that are passable all year and those that can only be used in the summer along with highways under construction. Republica de Colombia Mapa de Vias de Comunicacion en 1939. 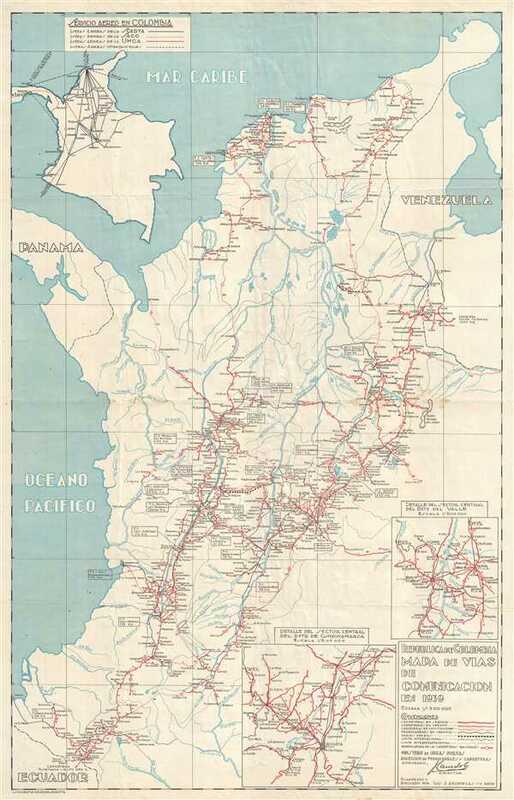 This is a 1939 Luis J. Arciniegas and Ministerio de Obras Publicas (Ministry of Public Works) road and communication map of Colombia. The map depicts the region from Panama and the Pacific Ocean to Venezuela and from the Caribbean Sea to Ecuador. Illustrating transportation networks throughout Colombia, highways and railroads fan out across the country. Important distinctions are made between the usage of certain roads, all of which are noted in red. Highways illustrated using solid red lines are passable throughout the year, while highways and roads that are noted using a red dashed line are passable only in the summer. Highways that are under construction are also included and are identified by a red dotted line. Railroads also provide important connections between cities and town throughout Colombia and are illustrated using black lines with perpendicular lines through them at regular intervals, a notation akin to railroad tied. Numerous specific lines are identified throughout the map by their endpoints and the distance between them is given in kilometers. Aerial cables are also noted in a handful of locations. Two inset maps are included in the lower right corner: one details the Departmento de Cundinamarca, while the other focuses on the central portion of the Departmento de Valle. A third inset map, in the upper left corner, illustrates air traffic routes throughout the region operated by three different airlines along with international routes operated by foreign airlines. This map was created and drawn by Luis J. Arciniegas for the Ministerio de Obras Publicas, now the Ministerio de Transporte, and printed by the Litografia-Granada in Bogota in 1939. Very good. Even overall toning. Closed minor margin tears professionally repaired on verso. Blank on verso.